Mistress, owner, guardian, and consumer – these are some of the labels that have obscured the identity of those who benefit from the household labour of others. Despite decades of research and activism, traditional representations of workers as being ‘one of the family’, and their employers as a substitute mother – or in some cases a capricious taskmaster – persist. The resilience of these tropes is mirrored by the limited changes in the actual labour conditions of domestic workers, even if many policies now set standards for wages, contracts, working hours, temporary employment, safety, and the protection of migrants. While large areas of the world still exclude domestic workers from the law, small shifts in law and social policy have contributed to the recognition of domestic workers as workers. It is in this context that the possibility of employee-employer relations within the private household emerges. The question then becomes: can employers act as allies in the struggle of domestic workers for dignity, recognition, and living wages? To put this question differently: can employers afford not to partner with domestic workers, given that their labour takes place in arenas of the familial, personal and intimate? As the Tanzanian trade unionist Vicky Kanyoka once explained, “It is our work in households that enables others to go out and be economically active . . . it is us who take care of your precious children and your sick and elderly; we cook your food to keep you healthy and we look after your property when you are away”. Domestic workers have become ‘the oil in the wheels’ of the global economy, and essential to the functioning of households of all types. The condition of domestic workers has gained significant traction in light of the growth of this sector globally. In 2015, according to the International Labour Organization (ILO), there were 67.1 million domestic workers at the global level, and more than double the amount of employers, since a number of domestic employees work for multiple households. The demand for domestic workers is expected to grow in the face of an aging population, decreased social services, and women’s rising labour market participation. Can employers act as allies in the struggle of domestic workers for dignity, recognition, and living wages? Housework and carework have remained women’s work, even if adult men devote somewhat more time to unpaid labour in the home than they did a half century ago. 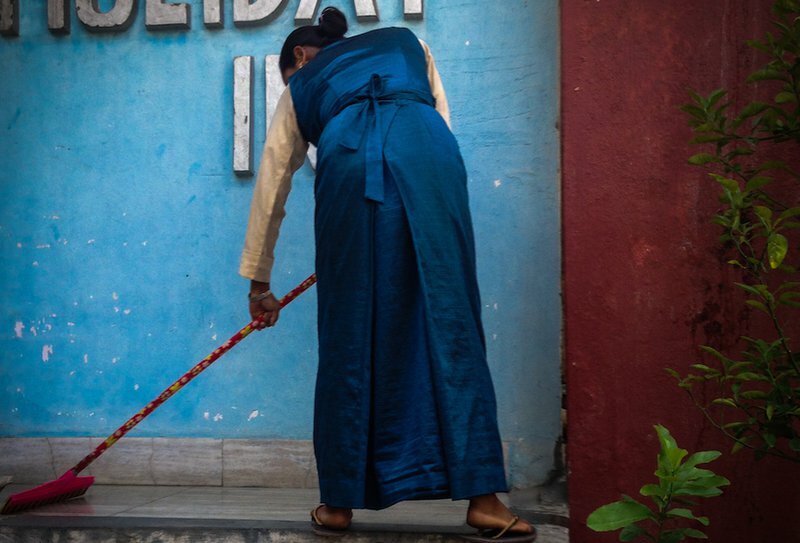 The perception that domestic work is women’s work feeds into the way domestic labour is undervalued, similarly to how various forms of “dirty work” have been relegated to those at the bottom of perceived racial, ethnic, class, and caste hierarchies. Despite the necessity of domestic labour, conditions are deteriorating with over 40% of all workers uncovered by minimum wage regulations and over half outside of work hour limits. Nonetheless domestic workers have won major victories during a period of union defeat. In 2011, they gained inclusion in global labour standards when employers and their representatives joined worker and government delegates to pass the International Domestic Workers Convention 189 (C189), the first global policy instrument recognising domestic work as part of the larger “decent work” agenda to bring the informal and migrant economy under the umbrella of human rights standards. In record time for such conventions, 24 nations have ratified C189 to date. Workers have also formed the International Domestic Worker Federation (IDWF), the first woman-led international labour federation, building upon and feeding into the work of existing national and regional unions and worker associations. Organisation by employer counterparts, however, has lagged, despite notable exceptions, such as Hand in Hand in the United States or Uruguay’s Housewives’ Association, the latter of which engages in tripartite bargaining over the terms of a national contract for domestic workers. The lack of organising at the employer level has meant that worker groups have had to step up and educate households on their responsibilities as employers. The policy advances that have anchored domestic workers’ organising victories hinge upon employers’ capacity and willingness to actualise these protections beyond paper. Rather than the moral consciousness that may have guided some ‘benevolent employers’ to provide selective protections in their individual homes – much like the ‘good employers’ who ‘cared’ for their servants during the colonial era – recently established policies provide a potential avenue for much needed structural shifts. Yet, the success of such policies still depends on the ability and desire of ‘good employers’ to enact newly established mandates, and agree on contracts that include a fair salary, days off, sick leave, parental leave, and so on. The various victories resulting from domestic workers’ national and global organising have generated new possibilities through which employers can actively participate in the movement for rights and justice in the home. This series draws together contributions on the role of employers in the fight for domestic workers’ rights from a range of perspectives. As leaders in the realms of employer activism, academia, policy, and labour organising, the experts we have convened in this policy debate have analysed the potential role of employers in terms of ensuring the rights of domestic workers, participating in activist movements, and transforming household practices. In doing so, these experts shed light on the structural and political constraints as well as the range of individual experiences that pervade various forms of intimate labour. As the leaders of the international movement of domestic worker repeatedly proclaimed, “women won’t be free until domestic workers are free!” The pieces within this dialogue invite a wider consideration of a collective investment in domestic worker rights, where the entrenched divides between “maids and madams” may gradually shift toward a co-investment in the the protection of the rights of those “who make all other work possible,” as the National Domestic Workers Alliance popularised. Bridget Anderson from the University of Bristol (UK) offers a nuanced view on the limits and the paradoxes of such possible alliances, while Lucero Herrera and Saba Waheed (UCLA, USA) refer to a survey from Californian households to offer the case for an alliance driven by common interests in everyday life and shared political demands. Rosa Navarro and Mechtild Hart, from the Latino Union of Chicago (USA), emphasise how such alliances should be based on employers’ awareness, however difficult to achieve, of the structural exploitation of workers happening in this field, which goes beyond individual moral obligation. The practical challenge this poses is well illustrated by the Andrea Londoño (Fundacion Bien Humano) contribution on the Colombian case: the powerful movement that has been rising in recent years from the workers’ side does not find correspondence on the side of employers, putting under threat the results achieved so far. A contrasting example is offered by the US-based organisation Hand in Hand, which has been campaigning, side by side with workers and other stakeholders, for better working conditions, with the goal of improving the experience of care and personal services for all subjects involved. That struggle involves moving into related campaigns, like affordable health care and immigrant rights. These experts shed light on the structural and political constraints as well as the range of individual experiences that pervade various forms of intimate labour. The outcome of these tensions at the global level is a complex scenario, with strong differences across countries in the profile and the history of employers’ organisations. This is discussed in depth in the contributions by Elizabeth Tang and Marie-José Tayah (IDWF) and Claire Hobden and Moriah Shumpert (ILO). By describing the actors and the policy measures that have been taken at national and international level, both pieces underscore the importance of empowering employers’ organisations in order to improve workers’ rights. Among others, we include the case of a particularly significant country to this debate, by looking at what happened in the Philippines since the ratification of C189, through the eyes of a workers’ union, with an article by Julius Cainglet from the Federation of Free Workers (FFW) and Ronahlee Asuncion, from the University of the Philippines. Indeed, the organising of employers generally appears to have been a positive step towards the expansion of rights for paid domestic workers, the recognition of domestic workers as workers, and the formalisation of the care sector. Precisely because the work occurs in private spaces, employers’ individualism still tends to shape workers’ treatment, which then becomes just a moral or affective concession. A social and collective solution comes up against engrained individualism, one of the main reasons why, in many circumstances, interlocking obstacles persist in the way employers serve as allies. Yet in individual households, domestic worker policy victories – even in their infancy – map the potential for employer alllyship and the gradual transformation of an industry through collective action.